The Bodum Chambord is a French Press of the highest quality on the market. With a little effort, you can enjoy a full-bodied aromatic coffee that makes you say ‘Mmmmmm!’ over and over again. 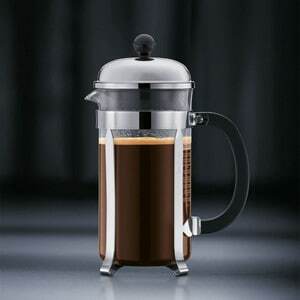 And after you are done you can leave it on the counter because this French Press is one stylish eye-catcher. 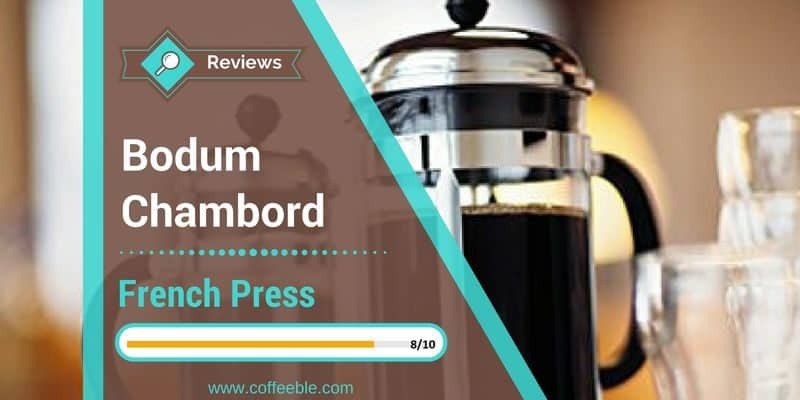 In this review of the Bodum Chambord 8 Cup French Press Coffee Maker, we will look at the design, the different sizes, the brewing process, the pros and cons and much more. The table above clarifies that coffee is measured in 4 oz cups with this French Press. 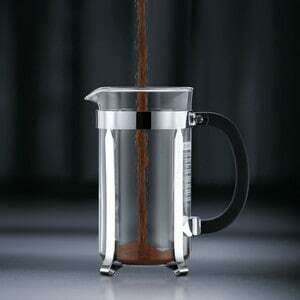 As a result, the 8 cup coffee press makes 34 ounces or 1 liter of coffee which serves about 2-3 people. 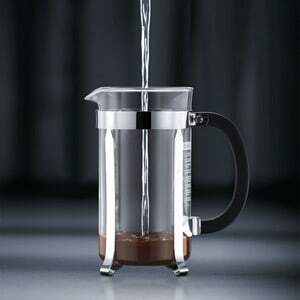 The Chambord is one of only two Bodum French presses that is equipped with the patented locking lid system that is supposed to eliminate splashing the hot water while pressing the plunger down. The frame and lid are made of stainless steel and undergo an extensive process of chrome plating to obtain a shiny surface which should last for many years to come. The plunger is also made of stainless steel. The beaker is made with a very strong Borosilicate Glass that is resistant to temperature changes. No more hot water splashing when pushing the plunger down thanks to a patented locking lid system. Polypropylene was the preferred material for the black handle, which provides a comfortable grip while serving. 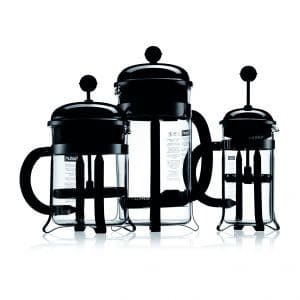 All Bodum products including the Chambord French Press is 100% BPA free! The Bodum Chambord has black and white imprints. While the white measuring units display the ounces and liters, the black numbers show the number of cups. With this saying the coffee press is clearly labeled so that the filling process is easy to handle. Start with a 1:10 ratio. For every 10 g of coffee, use 100 grams of water (strong!). Heat water to 195°F – 205°F and fill up the beaker. Stir for about 10 seconds and then put the lid on. Let it steep for about 4 minutes. Then press the plunger down, slowly and steady. Your French Press coffee is ready to be served now. 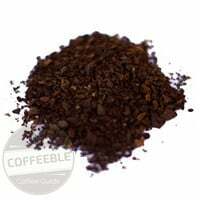 To reduce the amount of sediments in your coffee, you should use a coarse grind like breadcrumbs. Bear in mind that the coarser the grind the longer steep time is required. So you may need to use a timer to find your perfect timing. The Bodum Chambord includes a 3-part stainless steel mesh filter. The coffee oils can pass the filter and thus create a richer flavor of the coffee. No additional paper coffee filters are required so you also save some trees. Since the Chambord French Press runs completely power-free the whole process is focused on the right temperature and the perfect steep time. This means the whole brewing performance is in your hands. Cleaning the Bodum Chambord will certainly require more effort than just throwing a paper filter in the trash. However, with the integrated Coffee Catcher it should not take too long to remove all the coffee grounds. After pushing down the plunger, you feel a pop when the plunger locks into the catcher. Then you are able to remove the catcher with the coffee grounds by simply pulling out the plunger. With some water and soap, you should have it clean in no time. The Bodum Chambord has a coffee catcher so cleaning is a piece of cake! The 8 cup beaker should be big enough for your hand to get to the bottom to even catch the latest coffee grounds. Cleaning the Bodum Chambord right after you filled up the cups will make it easier to remove all coffee grounds! 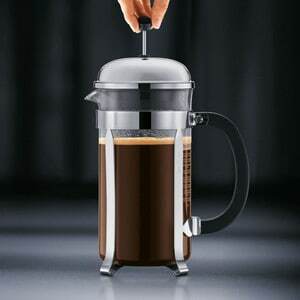 The Bodum Chambord French Press Coffee Maker produces an excellent cup of coffee. It also adds a nice safety feature with the patented locking lid system. The used materials like stainless steel and chrome make the Bodum Chambord the center of every party you will host at your home.